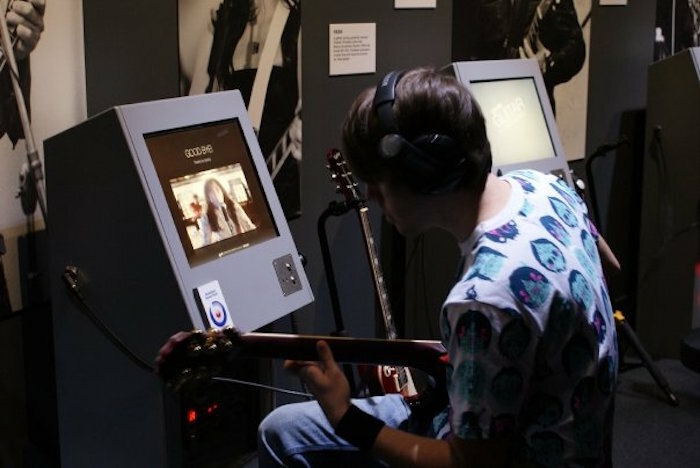 As Liverpool prepares for the launch of the British Music Experience, Getintothis’ Del Pike gets a sneak preview and talks to Cath Hurley, one of the team behind the exhibition. 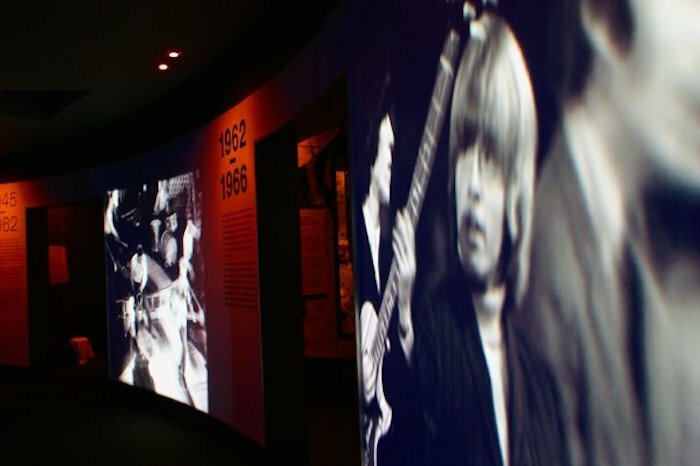 The British Music Experience which was previously at the O2 in London, has now moved permanently to Liverpool. 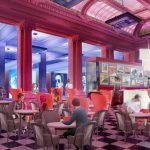 The first-class passenger lounge of the Cunard Building which recently housed the excellent About The Young Idea exhibition devoted to The Jam will now be the permanent home to this rebooted version of the exhibition with new artefacts and updated content. 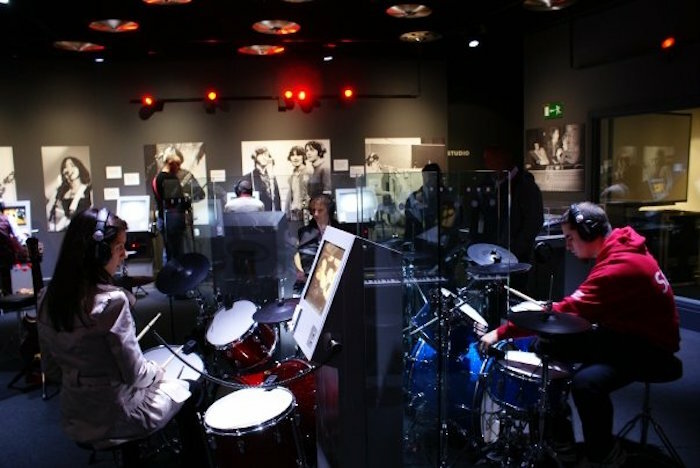 It works well in this location being a perfect companion to the Wondrous Place section of The Museum of Liverpool just yards away and of course The Beatles Story at the Albert Dock. 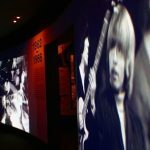 The Beatles are already covered in some detail in those places so the BME chooses not to overlook the band but offer an alternative look, exhibiting just period merchandise (plates, dolls, bubble gum cards etc). 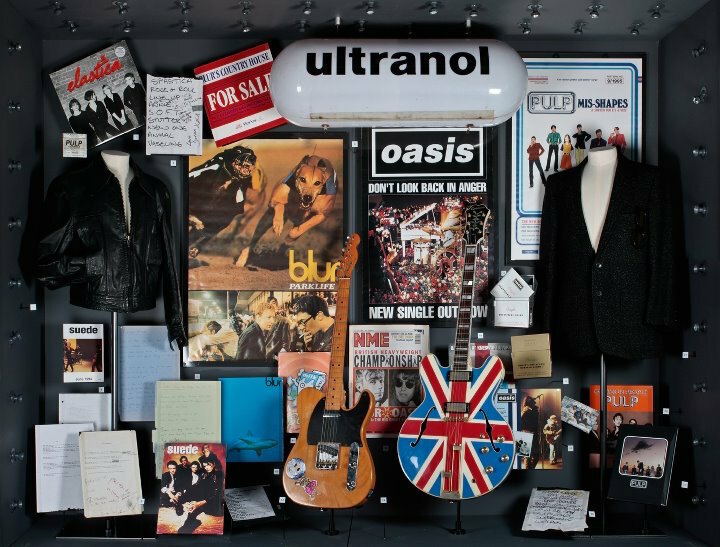 One of the exhibition’s key team Cath Hurley shows us around the space and despite being at this stage unfinished with no audio-visual content, the treasures on display are at times breath-taking and cover pretty much all stages in the history of British popular music. 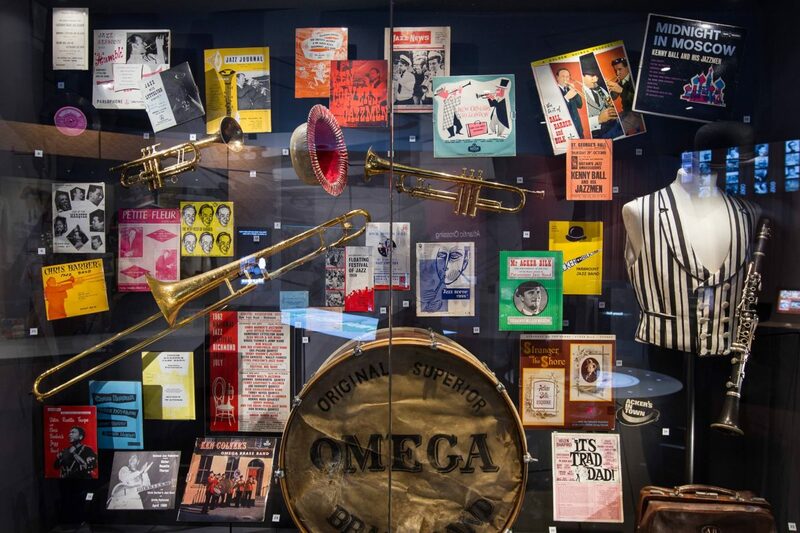 Starting with the jazz era of the 1940s, and travelling through skiffle and the rock and roll era, we already see some incredible pieces including Lonnie Donegan’s washboard and Billy Fury’s pristine, shimmering suit. 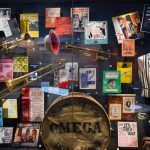 Each glass case contains at least one item to steal your breath surrounded by much memorabilia; tickets, letters, rare photographs, merchandise and mementoes. 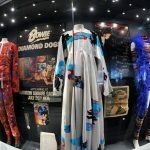 One of those truly astounding items in the 60s section is the famous blue gown of Dusty Springfield, shown alongside dresses of Sandie Shaw and Cilla. To see an item face to face that you have gazed at repeatedly on BBC4 archive shows, never fails to thrill. Dusty’s dress is a fine example. There are a few examples of artists who had an impact on British music culture by their visits and time spent here, like honorary Brit Jimi Hendrix whose beads are on show here, the very ones he is wearing on the cover of Are You Experienced? 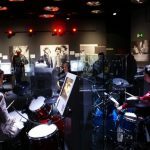 Perhaps the most fascinating piece here is a letter written by Buddy Holly asking a local venue if they will allow him and his High School band to play a gig. Items such as this are direct links with the very origins of rock and roll and are in some ways quite humbling. Folk rock is covered by the original artwork from The Small Faces’ Ogden’s Nutgone Flake album and paraphernalia from The Incredible String Band and Fairport Convention. Psychedelic rock is covered too in the UFO poster art of the time and Oz magazine covers. 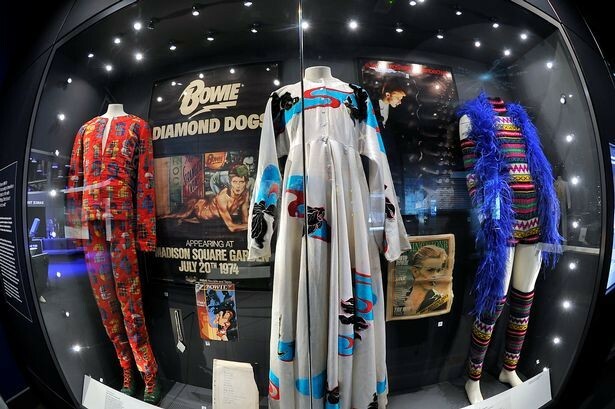 The major pull here is going to be the Bowie Stage outfits including the bizarre knitted affair from the Ziggy Stardust tour, complete with leg warmers. Cath points out with excitement the makeup smear on the shoulder of one of the outfits. It is these small details that bring you closer to the stars and in the case of David Bowie, we are talking legends. The Glam Rock era is a particular highlight, but the one item that genuinely left us all speechless has to be Adam Ant’s stage costume. It is the one that he wore during the whole Kings of the Wild Frontier era, all braids and buttons with an air of Errol Flynn. Only when you stand in front of something like this do you realise how absolutely iconic these outfits are. 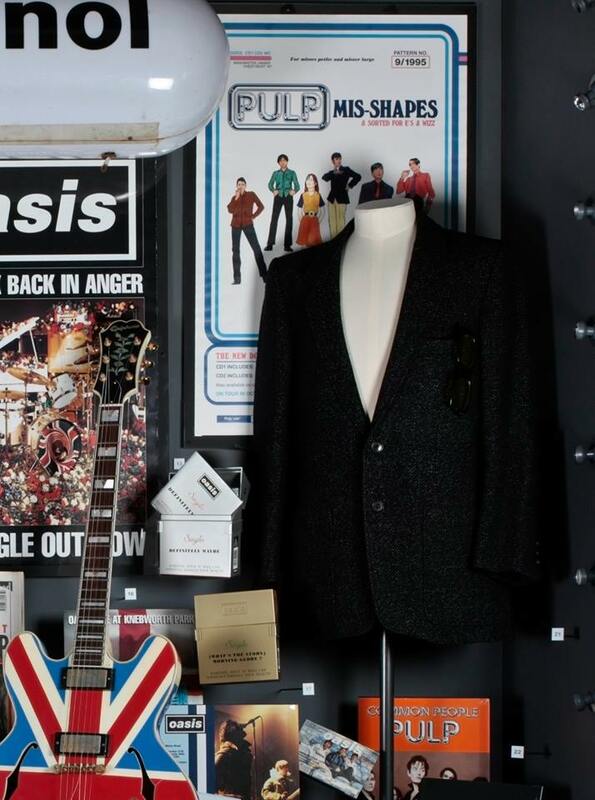 It shares a case with a Colour by Numbers era Boy George outfit and an incredibly slim fitting suit of Spandau’s Tony Hadley. It is noted that sadly, he wouldn’t fit in it now. 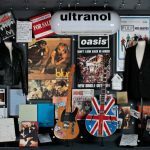 A shattered guitar and a slew of gaudy artwork heralds punk in stark contrast to the Ska cabinet, housing the monochrome imagery of Coventry’s Two Tone movement. We discussed how powerful the anti-racist themed sleeves and posters still are thirty plus years on, while appreciating the beauty of the pork pie hats. This was a movement that shouted out its ideals from the rooftops. 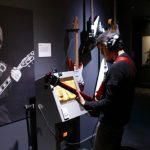 Heavy metal is duly covered with Def Leppard stage gear and Iron Maiden artwork, and a large section is devoted to Live Aid. Perhaps the most exciting area for the Getintothis team was the 90s cabinets. 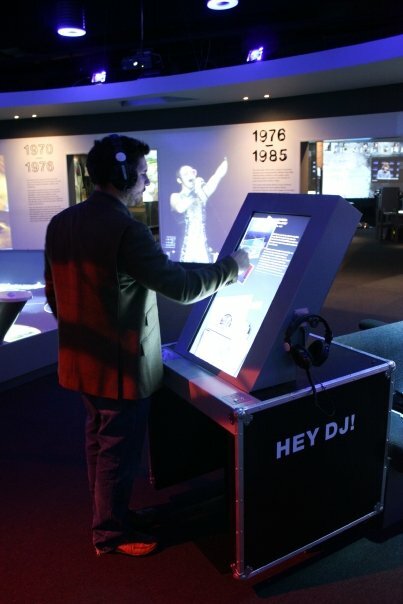 A display devoted to Manchester includes the cover work of The Smiths, a piece of the Hacienda dancefloor and Mani’s paint caked clothes from the famous Stone Roses’ NME cover during their reign. A companion piece to his Jackson Pollock inspired guitar, decorated by John Squire, also on display. 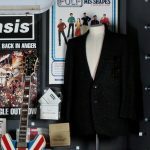 Another section covers the Britpop era with set lists from Blur and Elastica, Graham Coxon’s and Noel Gallagher’s guitars and Brett Anderson’s and Jarvis Cocker’s jackets. An enormous burger hangs from the ceiling from the stage set of Blur’s Great Escape tour. Brilliant. As instantly recognisable as Adam Ant’s get up are the full set of Spice Girls’ outfits from their 2007 reformation. Looking like oversized Barbie outfits and incredibly fragile, they are stark reminders of how important the whole Girl Power movement was, and how fast the years have flown by since their unforgettable Brits appearance in 1997 . Further less dynamic female artists are represented by Duffy and Kate Nash. As we draw to the end of the exhibition we see sections of The X Factor (Honey G’s cap and tracky!) 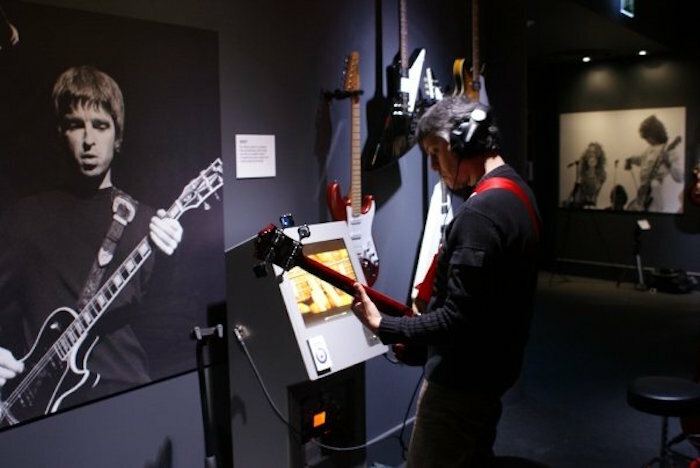 and The BRITs, still under construction and an interactive room where visitors can play along with real instruments to videos of their heroes, Clapton, Townshend, Gilmour and even our Ringo. There’s also a dance booth here, to represent the UK Club scene where old ravers can show their moves. Cath Hurley is justifiably enthusiastic, a quick tour of the gift shop and coffee bar leads us to the interactive room where she explains how this will be used to educate and inspire. There are plans to include kids from the age of four in activities based around the exhibition. The large space has a classroom feel to it but this is contradicted by the stylised blackboards high on the wall bearing the Pink Floyd lyrics “We don’t need no education”. 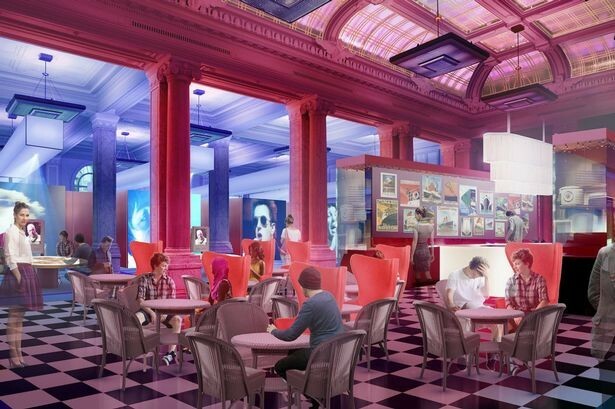 Cath tells us how the room will be transformed into an exciting learning environment and suggests some of the ways they intend to attract a younger audience. All very intriguing. 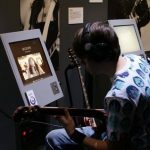 Based on the success of the Jam exhibition last year, The British Music Experience, with its 600 plus incredible artefacts, stands a grand chance of being one of the city’s most exciting attractions and should guarantee a lot of interest with visitors to the city as well as Liverpool folk. The exhibition opens to the public on March 9. 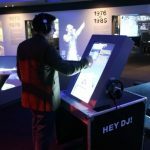 All photographs taken from British Music Experience London, with pictures from the Liverpool experience coming soon.